At least, that’s the only way I can explain the shortness of breath that had turned this last uphill stretch into a taxing climb. ‘You’re the only person we’ve passed all day,’ chirped the pensioner in the exact tone of voice that made me want to slap him silly as the trio left me in their wake. Pedantic peak-bagging purists don’t include Mt Kosciuszko as a valid ‘climb’ for the 7 Summits despite it being Australia’s highest point. Puncak Jaya (aka Carstensz Pyramid) in Papua, New Guinea is more than twice as high, they say. And the Australian continent includes New Guinea, they say. And the island of New Guinea is on the Australian continental shelf, they say. The purists climb both, thus extending their 7 Summits to 8 peaks. That SO makes sense … NOT! The smart money says the REAL reason to exclude Mt Kosciuszko has nothing to do with peak bagging and everything to do with mountaineering elitism. 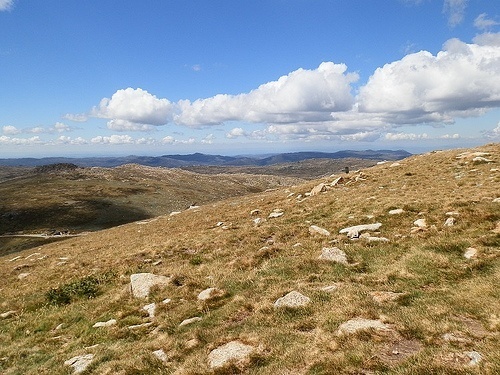 … compared to the estimated 100,000 climbers who conquer Mt Kosciuszko each year. So hardly a mountaineering exclusive, although people like me DO take training seriously and prepare for the rigours of the 2228m (7313 ft) summit ascent by a test climb on Mt Wycheproof, the world’s smallest mountain! Yes, you heard it here: The summit climb is embarrassingly easy! 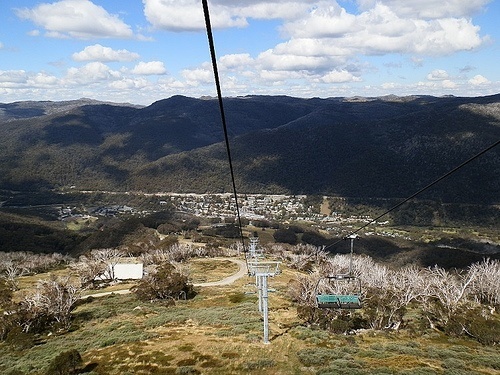 Especially given the most difficult section of the climb – the 600 m (1982 ft) elevation from ski town Thredbo to the Eagle’s Nest restaurant (highest in OZ) – can be completed by chairlift. From there – a tiny 3.5° C (38° F) the day we climbed – we were above the tree line with a 6.5 km (one way) trek to the top undulating upwards over a 300 m (991 ft) elevation. Its place in the 7 Summit pantheon isn’t the only controversy surrounding the mountain. A neighbouring peak was originally thought to be the highest and dubbed Mt Kosciuszko, with the current Mt Kosciuszko called Mt Townsend. When a survey showed the mistake, the names were switched so that Kosciuszko remained the name of Australia’s highest peak! Although ‘peak’ isn’t the right word – it’s more of an imposing rounded dome rising above the surrounding landscape often enough to provide a tantalising glimpse of journey’s end. Or at least the half-way mark because the shortest way back is to return to the chairlift the way you came. But all that is well in the future at the start of the hike with spectacular views WAAAAAY down to Thredbo and up along the rocky Ramshead Range. 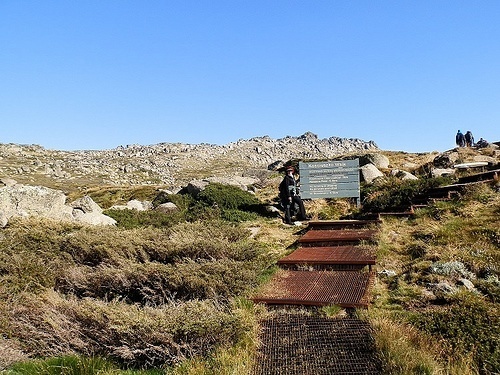 The kilometres pass quickly along the raised metal walkway that took 17 years to construct that protects the fragile alpine heathland. It’s a nostalgic moment as we cross the headwaters of the Snowy River. Pastoral country until being phased out in 1969, Aussie poet ‘Banjo’ Paterson’s classic poem ‘The Man From Snowy River’ superbly captures the legend of this wild high country before the National Park was proclaimed in 1944 and the river harnessed for the Snowy Mountains hydro-electric scheme from 1949. We climb up to a saddle from the river, and now the Australian records come thick and fast. Lake Cootapatamba – highest lake and one of 5 mainland glacial lakes; Rawson’s Pass, overlooking highest permanent settlement Charlotte Pass, and location of highest Scenic Public Toilet at 2100 metres; then the final ascent – a relentless climb along the old Charlotte Pass road circling round the dome to the top. And the staggering 360° view over the Main Range, Monaro tablelands and Victorian High Country. Explorer Count Paul Strzelecki, whose commemorative statue in nearby Jindabyne portrays him as a cross between previous OZ prime minister Bob Hawke and Dracula, was the first to actually record a climb in 1840, although the peak is likely to have been climbed beforehand by local Indigenous people, who called the mountain Tar Gan Gil, and white settlers. Until 1974, when the road was closed to traffic to help preserve the fragile environment, visitors could drive to the Mt Kosciuszko summit. Summit Proof Shot! Who are these people??!! The return trip punctuated by the obligatory tinkle in the highest public toilet in OZ, countless rest exhaustion photo stops, and a voluntary go-slow when I tired of the student wisdom pouring out like … well, lets just say waste … behind me. ‘Sir said life is short,’ one adenoidal youngster stated to a gaggle of giggling comrades. ‘That is incorrect. Life is the longest thing you do,’ he concluded triumphantly. The only cure for altitude sickness is to lose altitude quickly, which the Kosciuszko Express chairlift descent delivers in spades. And just like that, my birthday present Kosciuszko adventure was over, leaving me with a fine sense of anti-climax and an almost irresistible urge for a tacky piece of memorabilia like a ‘Kozzie’ snow dome or a ‘Get High’ T-shirt to mark the occasion. But I settled for posting some photos on Flickr and writing this blog post instead. Besides … I’ve been to the Mt Kosciuszko summit before! So I’m claiming Kosciuszko as Peak #1 in my 7 Summit Challenge! But don’t hold your breath for the next instalment – I’m going for the slowest 7 Summits ever! « RED Alert #8: A Double-half of RED! I invite you also to the English version of this http://www.mtkosciuszko.org.au website. You will find there a lot of information about the conquest of Mt Kosciuszko the highest peak of Australia, and about Paul Edmund Strzelecki the explorer who gave the mountain its name. Thank you Zdz – I have added your link to my post! Mt Kosciuszko is AWESOME! What a great experience. Must say I live the old photo the best. Haha, the old pic makes me look better than the more recent one Mallee! If you’ve never done the climb it’s really worth considering! Now that’s serious vintage, Red! And just my era, so I’ll need to be finding similar of the same on a different continent, but the ‘costumes’ won’t differ much methinks 😉 Wow serious climb, bad luck with altitude sickness. We climbed Mountain to Kilimanjaro in 1985 and it was a big thing … lots of people stretcher ed down. Your chair lift ride sounded amazing! Hahaha, I’m sure mountaineering gear has changed since back then, Jo – at least I hope so!!! Actually, Mt K was embarrassingly easy – even for someone like me who wasn’t that fit (hence the ‘altitude sickness’). I’m sure your mountaineering feat is much more impressive – but you’re right about the chairlift! Thank you Byztek for this information! It’s an interesting place, with an even more interesting history! Ah Ha – I see you are using my Flickr photo link trick on this post. Always a good feeling to pass the knowledge to a fellow blogger. Well, lets wait & see how it translates to my new blog! Coming soon!! Oh, you were a cute little mountaineer girl, even back a few years ago! I’d need a lot of camera breaks on that climb and would probably be too exhausted to actually focus to get a picture! Driving to the top reminds me of mountain roads in Colorado we’ve driven up and then when we get out to walk reading signs that tell you to beware of altitude sickness…always makes me feel like I’ve accomplished something just to stay alive while riding in the car! @Betty – It sure is a different part of Australia! Even if I don’t remember it from my first visit … Have a great week! @Tina – Thank you! It was a pleasure taking them!! @Vivid – So glad you enjoyed it!! My pleasure to show you!! @Filip – It’s VERY rocky!! But I didn’t notice that when I was little!! @Sallie – I can see where the seeds of exploration were planted … but I now LIVE for my ‘camera’ breaks. Just how many pix of a mountain climb can you take, anyway?! LOVE the idea of accomplishing something just by riding in the car – I’ll sure be adopting THAT one!!! What a rough landscape, cute picture of when you were a kid. Aren’t you two cute standing on Sumit Proof getting your picture taken…. You guys look cold though. Thanks for this post, Red, as it feels as though I shared in the climb with you and I’ve never been there before. Yet. congratulations on the climb. What amazing scenery and views! Loved looking at your photos! @curly purplepig – Thanx! It’s so different to other parts of Australia! @Saucy Kod – I had a real sense of achievement with this one, although it was a little anticlimactic to find I’d done it before … the rocks in the final ascent were pretty hard on the feet, but I made it up and I made it down! @Jeanne – I would have been REALLY peeved if the cloud had blown in earlier and blocked the view! @LONDONLULU – It’s just like they say about childbirth – once it’s all over you forget the pain!!! Exhausting, yes – but SO worth it! @Andrew – HAhaha, but think BIG – why not install a chairlift right to the top?!?! Or run 4WD Bus tours to the top?? Although you could almost do that now … so many possibilities! @Karen – Does it look how you remember it?? It must have been more difficult back then – the walkway makes it reasonably easy going now! @ladyfi – It’s awesome to be as high as you can go in OZ with an uninterrupted view! @Carole – Haha, UP doesn’t really work for me either … and I was too knackered by then to be feisty, although my withering look could have curdled milk! @Mary – I think the narrator’s words lost something in the translation – I was just too knackered to care … and I SO wish you were right about the great legs! @Rose – A lot of people didn’t get breathless – the main difficulty is the length of the hike, not the climb itself … but still, I’m SO glad you’re impressed! @Fun60 – I’m laughing about it now … there’s not a snowball’s chance in hell that I’ll be doing any of the others anytime soon!!! @FruitCake – Fantasies, fantasies … where’s a palanquin when you need one?!?! And a café/bar at the top would be a fine thing too … but I’m sure I’ll be so famous next time that I’ll get the STAR treatment!!! @Dina – I couldn’t believe the resemblance!! @George – HHHMMMmmm… I think I need a bit of a breather before I try the next one! Like about 40 years!!! @eileeninmd – When I first talked about doing the climb, I couldn’t believe it when Dad told me I’d already been there! I demanded proof, and here it is!!! Cute picture of you and Pilchard. Congrats to the climber to the top. It always feels so good, doesn’t it? wow, beautiful photos! this place looks amazing! Congratulations on reaching the top of peak #1. Once you have completed the other 6 you will be laughing about this first one. That big scenery is so wonderful! Majestic shots. It’s a lot rockier than I expected, although I don’t know why I would expect otherwise. Perhaps I thought there’d be snow, being part of the Snowy Mountains as it is. It’s a lovely area to look at though. I always take a small camera on such climbs so I can stop to take a picture. Also gives a chance to breath and rest. You may also have done this, but you had great photographic success. Oh gosh, fabulous photos! Congrats on the climb. I did it back in ’96, and didn’t take a single photo. I enjoyed accompanying you on your trek up the mountain, and I look forward to joining you for the remaining six summits. Your photos are beautiful. Well done you and what a nice conclusion. As for me, I will wait until The Abbott is elected, sells off the national parks and a developer puts in a proper road. G’day Red, I’m mighty impressed at your climb (breathless or not!) love that pic of you and Pilchard….. ha ha the proof! I do love the year 19?? photo. All of it, drenched in sights. Words to live without, unreliable narrator~give him a few years. Amazing views and scenery. Loved the photos, especially the last one. Have a happy day! I read all that, and now I am exhausted! I need a nap to recover. You must have tons of energy to be able to make it to the top, Red! Cross between Bob Hawke and Dracula…LOL. Frequent photo stops? I’d need an entire crew determined to make a full-length feature film – with full catering and portable private dressing room! But well done Red, well done.